Click image to enlarge Sacajawea State Park, Washington. 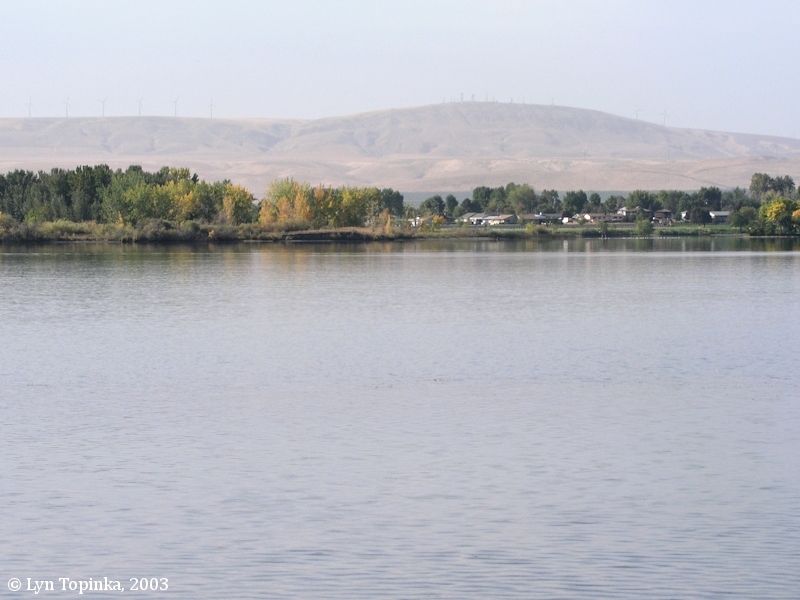 Lewis and Clark camped at this location (the actual location is now under the waters of Lake Wallula, behind McNary Dam) October 16 and October 17, 1805. Image taken September 29, 2003. "... Captain Clark wrote that the 'great object was to make every letter sound' in recording Indian words in their journals. The pronunciation of Sacagawea’s name in years since the expedtion as 'Sacajawea' does not match 'Sah-cah' gah-we-ah,' the way that the captains recorded the young Shoshone woman’s name. In fact, her name -- made by joining the Hidatsa words for bird ('sacaga') and woman ('wea') -- was written 17 times by the explorers in their journals and on their maps, and each time it was spelled with a 'g' in the third syllable. ..."
"... Sacagawea, with the infant Jean Baptiste, was the only woman to accompany the 33 members of the permanent party to the Pacific Ocean and back. Baptiste, who Captain Clark affectionately named 'Pomp' or 'Pompy' for his 'little dancing boy' frolicking, rode with Sacagawea in the boats and on her back when they traveled on horseback. Her activities as a member of the Corps included digging for roots, collecting edible plants and picking berries; all of these were used as food and sometimes, as medicine. On May 14, 1805, the boat Sacagawea was riding in was hit by a high wind and nearly capsized. She recovered many important papers and supplies that would otherwise have been lost, and her calmness under duress earned the compliments of the captains. ..."
Lewis and Clark reached the junction of the Snake River with the Columbia River on October 16, 1805, and they set up camp in the vicinity of today's Sacajawea State Park, on the Columbia side, a little upstream of the point. The men remained there for two days. 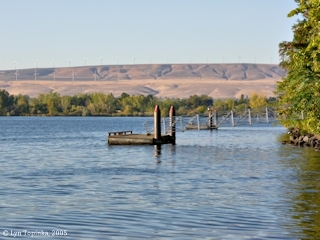 A good view of the Columbia River, the "Point" the men camped on, and the mouth of the Snake River can be had from Two Rivers County Park, across the Columbia from Sacajawea State Park. On October 18, 1805, Lewis and Clark began their journey down the Columbia. Their campsite of October 18, 1805, was downstream at Spring Gulch. 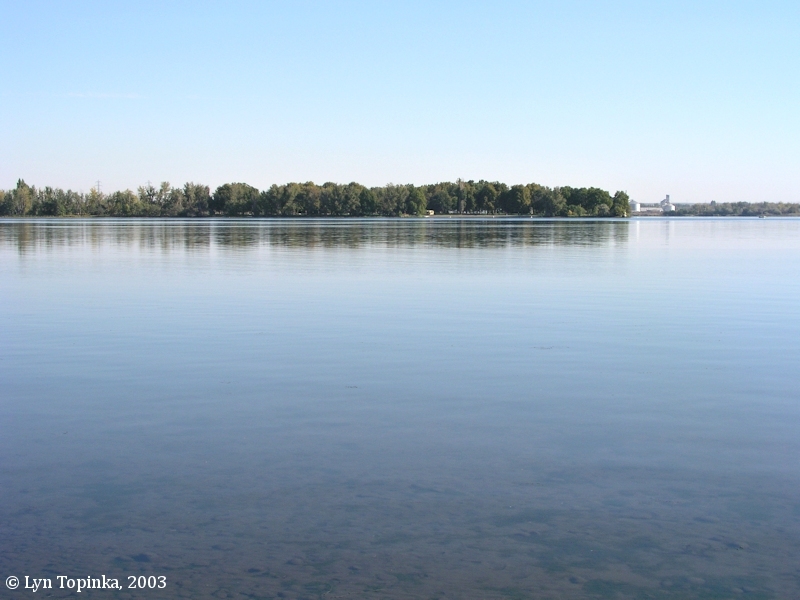 "During the last Ice Age, the confluence of the Snake and Columbia rivers looked very different. Rushing floodwaters were slowed by the narrow opening at Wallula Gap, backing up to form a huge temporary lake. Repeated floods covered the area under as much as 800 feet of water in a temporary slack-water basin now known as Lake Lewis." Research has shown however that the flood waters reached an estimated 1,250 feet at Pasco, only eight miles upstream of Sacajawea State Park. Estimates at Wallula Gap were also at 1,250 feet. "For thousands of years, the site of Sacajawea State Park was a traditional gathering, fishing and trading place for Native peoples. Sahaptian-speaking Indians came to trade and to catch and dry fish for winter. Some people remained through the winter at this popular gathering place. On October 16, 1805, the Lewis and Clark Corps of Discovery arrived at the confluence of the two rivers and stayed for two nights. They explored the area and traded with the friendly Native people before paddling down the Columbia River to the Pacific Coast. 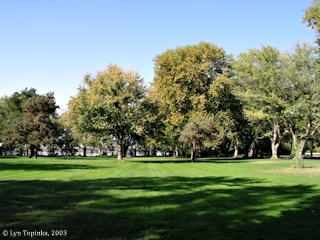 The park was eventually named for Sacagawea, the Agaiduka Shoshoni Indian woman who accompanied the Expedition. 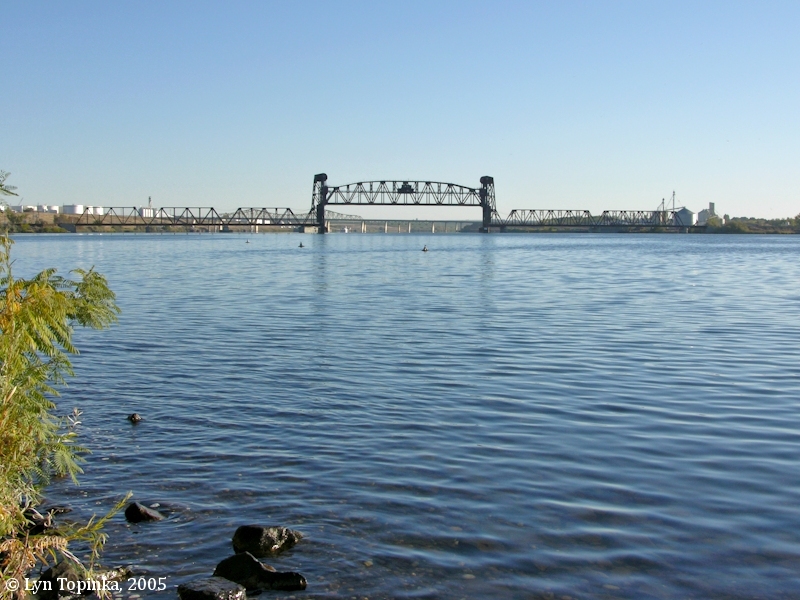 The Northern Pacific Railroad established a construction site at the confluence of the Snake and Columbia rivers in 1879. The site quickly grew into a town, which the railroad company named Ainsworth. The town peaked with a population of 1,500 people, but after Northern Pacific moved its construction work to other locations, the town eventually disappeared. 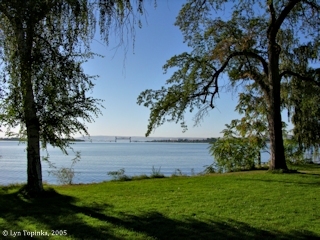 Today, most of the original town site is within Sacajawea State Park. In 1927, Thomas and Stacie Carstens donated an acre of land to the Daughters of the Pioneers of Washington -- Pasco Chapter to help preserve the original Corps of Discovery campsite. The women hand carried buckets of water to care for trees they planted to mark the location of the campsite and led the effort to erect the monument that still stands today. In 1931, the women deeded the land to Washington state, and the land was designated as a state park. With support from the local communities and the state, the Works Progress Administration (WPA) constructed a museum at the park in 1938. The Sacajawea Museum was built to display Native American artifacts from the tribes of the Columbia Plateau. The museum, now known as the Sacajawea Interpretive Center, and three other WPA buildings are still in use. Source: "Your guide to Sacajawea State Park and Interpretive Center" brochure, Washington State Parks and Recreation website, 2015. Click image to enlarge Sacajawea State Park, Washington. View of greenery of Sacajawea State Park as seen from Two Rivers County Park, Pasco, Washington. 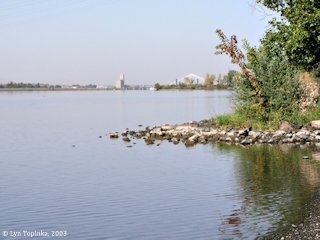 The mouth of the Snake River is to the right. Image taken September 29, 2003. 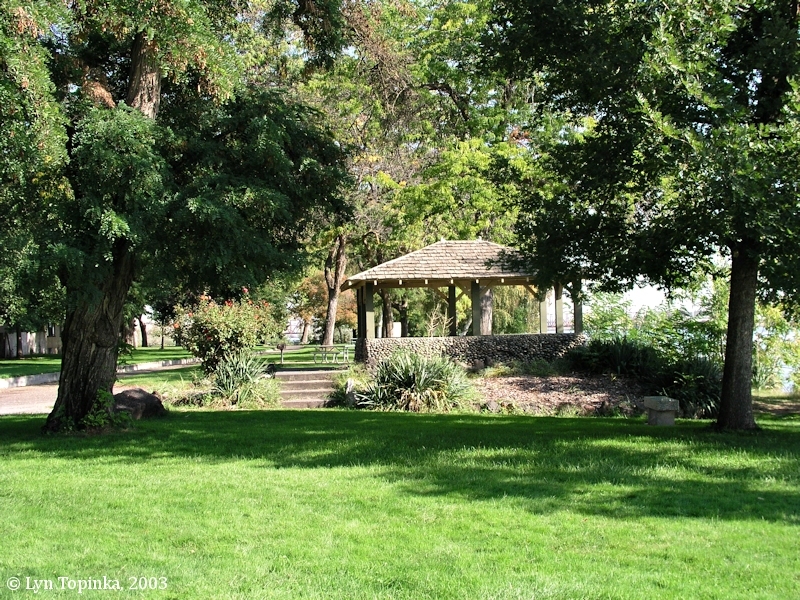 Click image to enlarge Gazebo, Sacajawea State Park, Washington. Image taken September 29, 2003. 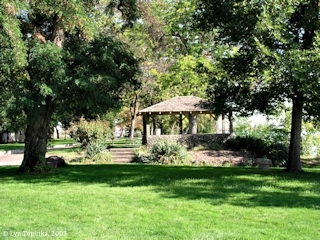 The gazebo was built between 1933 and 1935 and was originally known as the "Vista House". Click image to enlarge Looking downstream, Columbia River, as seen from Sacajawea State Park. Image taken September 25, 2005. "The Northern Pacific Railroad established a construction site at the confluence of the Snake and Columbia rivers in 1879. The site quickly grew into a town, which the railroad company named Ainsworth. The town peaked with a population of 1,500 people, but after Northern Pacific moved its construction work to other locations, the town eventually disappeared. 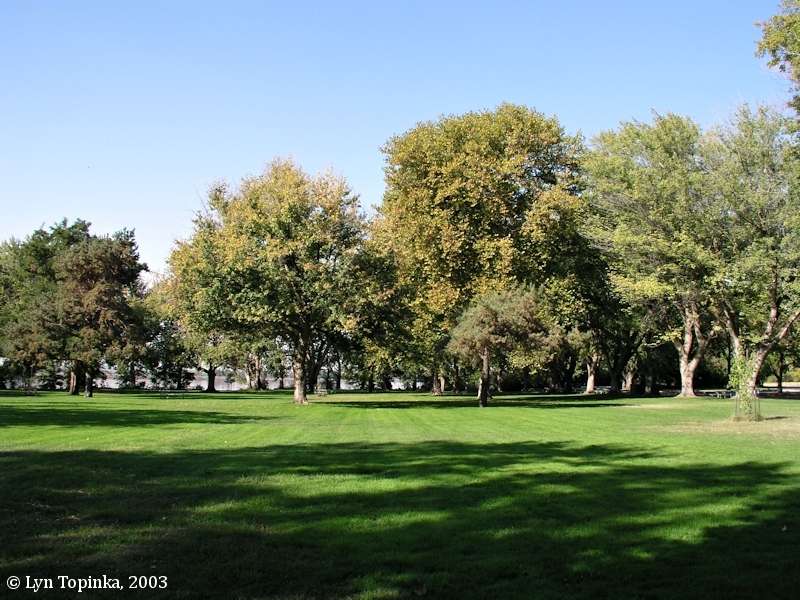 Today, most of the original town site is within Sacajawea State Park." "This long-abandoned railroad construction town was 2 miles east of present-day Pasco, near the mouth of Snake River, Franklin County. It was founded in October 1879, by Northern Pacific Railway engineers as a western base for operations. Its importance terminated when rail traffic between Pasco and Tacoma started to move through Stampede Tunnel in the Cascades, rather than via the Wallula route. Building of a bridge across Snake River and the elimination of a ferry were contributing factors. It was named for Capt. J.C. Ainsworth, a prominent official of the Oregon Steam Navigation Company." The seven large "Story Circles" are large rings of basalt, some raised and others set into the ground, with themes from Native cultures sandblasted into the rock. 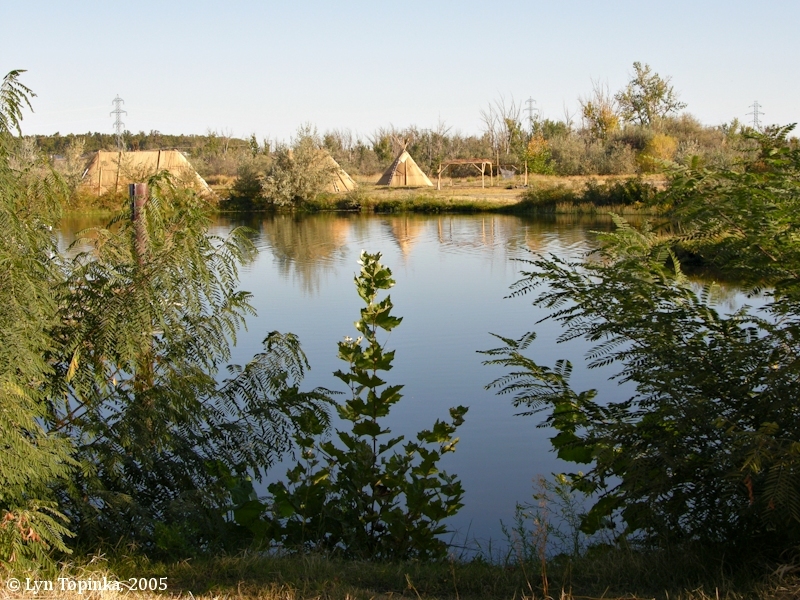 During the summer of 2005 Sacajawea State Park hosted a re-creation of a traditional Wanapum native village, built by the Wanapum Band of Native Americans, Grant County PUD, and the Wanapum Heritage Center. Click image to enlarge Sacajawea State Park, Washington. 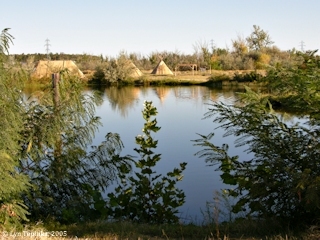 Re-creation of a traditional Wanapum native village, built by the Wanapum Band of Native Americans, Grant County PUD, and the Wanapum Heritage Center. Image taken September 25, 2005. Sacajawea State Park offers good views of the mouth of the Snake River where it merges with the Columbia, and across the Columbia towards the Horse Heaven Hills. Upstream the Pasco-Kennewick Cable Bridge can be seen. 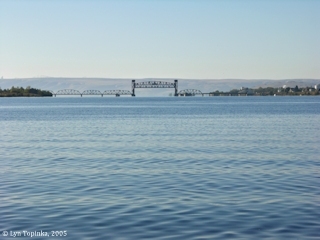 Click image to enlarge Mouth of the Snake River looking towards the Columbia River and the Horse Heaven Hills. View from Sacajawea State Park. 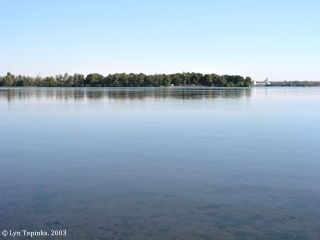 Image taken September 25, 2005. Click image to enlarge Homes of Kennewick, Washington, and the Horse Heaven Hills. Looking across the Columbia River towards the Horse Heaven Hills. 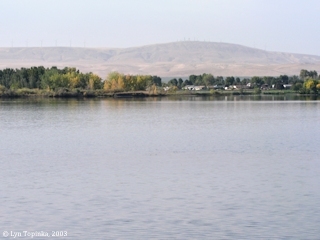 Image taken from Sacajawea State Park near the mouth of the Snake River, Washington, September 29, 2003. 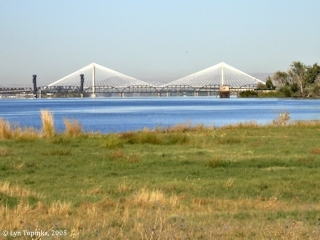 Click image to enlarge Columbia River and Pasco-Kennewick "Cable Bridge", as seen from Sacajawea State Park, Kennewick, Washington. Image taken September 29, 2003. Click image to enlarge Columbia River and the Pasco-Kennewick "Cable Bridge", as seen from Sacajawea State Park. 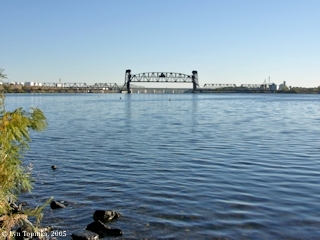 View of old railroad bridge is in the foreground. Image taken September 25, 2005. Click image to enlarge Looking up the Snake River. View from Sacajawea State Park, from boat dock near "the point" at Sacajawea State Park, looking upstream Snake River. Image taken September 25, 2005. Click image to enlarge Looking down the Columbia River from Sacajawea State Park, Washington. On October 18, 1805, Lewis and Clark left their camp at today's Sacajawea State Park, and began their journey down the Columbia River. Image taken September 25, 2005. "... This morning Cool and fare wind from the S. E. ... Took our leave of the Chiefs and all those about us and proceeded on down the great Columbia river ..."
Penny Postcard: Sacajawea State Park, Washington, ca.1940s. Penny Postcard, ca.1940s, "Sacajawea State Park, State of Washington." In the private collection of Lyn Topinka. Towards evening we arrived at a large fork that came into this River [Snake River] from a Northerly direction & was much large than the fork which we descended which we supposed to be the Columbia River -- The country round where the forks of these two River lay was level & smooth barren plains, with not a Tree to be seen as far as our Eyes could extend. Along the Shores grew a few Willows. We found upwards of 200 Indians, that were encamped on a point of land, that lay between these two Rivers, in a very pleasant situated place. We Encamped near those Indians on the same point of land [Sacajawea State Park]. Distance across the Ki-moo-e nim 575 yds water ..."
. a clear pleasant morning. we delayed here untill after 12 oClock to day Capt. Clark measured Columbian River and the Ki mo e nem Rivers [Snake River] and found the Columbia River to be 860 yards wide, and the ki moo e nem R. to be 475 yards wide at the forks.